After dipping into crewel embroidery with the Crewel Rooster project, and following up on quite a bit of talk about wool threads lately, I thought I’d review some books on crewel embroidery that I think are pretty good. And here’s another good one to add to the list – in fact, this book has a lot of perks that the others don’t necessarily have, so let’s take a good look at it…. 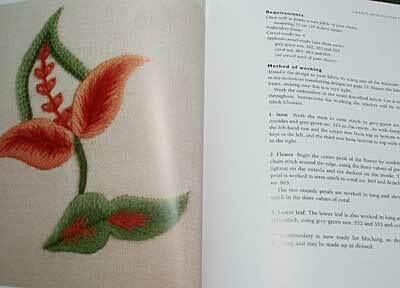 The book is Crewel Embroidery: A Practical Guide, by Shelagh Amor, a Milner Craft Series book. The book is a soft cover – stiff flexible board for the cover – and the pages are printed on a nice satin-finish paper. It’s a nice-looking book overall. I’m a little surprised at the amount of white space in it, but the content is good. The book begins with the tried-and-true, typical information: a little bit of history, a section on materials and tools, a section on transferring your design onto your fabric, and a section on framing up the work and getting ready to stitch. There’s a very nice little section on color selection – a color guide that explains color relations and so forth, to help the beginner make good color choices. 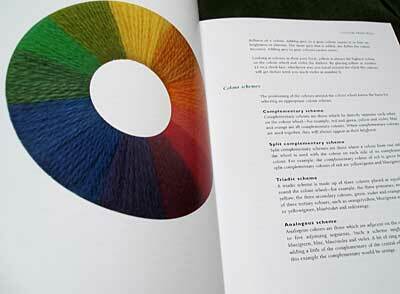 This is a very nice addition to the typical preliminaries in any embroidery book, and though the topic is briefly treated, it is thorough enough to help the reader form good ideas about color. 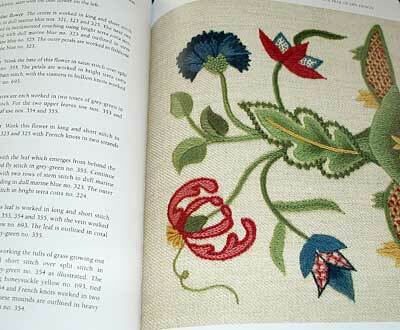 The bulk of the book is divided into “Crewel Designs and Stitches.” Beginning with very simple designs that are typical of traditional crewel work and progressing to more complex designs, the author presents little lessons in crewel stitching. For each of these exercises, she includes a line drawing of the design, a photo of the finished product (close up, to see the stitches clearly), a materials list for the exercise, and then a step-by-step method of working the design. I personally like this approach for beginner work: it’s a textbook-exercise approach that teaches the skill through an incremental sort of development, each stage working on a project a little more challenging, but still giving the stitcher the ability to skip ahead. Another feature I really like! 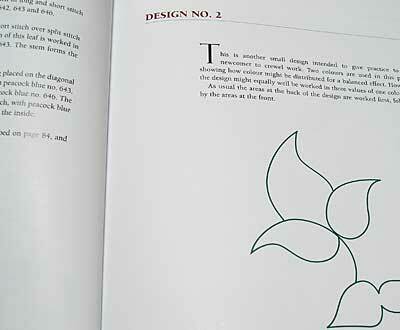 Progressing through the exercises, we finally arrive at the Tree of Life design, and, rather than just hand you a design and say “Stitch this,” the author actually takes the reader step-by-step through designing your own Tree of LIfe. Nice touch! She does give her finished design – with a materials list and method of working, just like the previous lessons – but it’s great that she also teaches how to design your own. And there are pages full of circles, too. Every book needs pages of circles. These circles have a purpose, though – an extension of the design-teaching applications in the book! One of the later exercises focuses on a spiral design, and again, the author shows us how to create our own step-by-step. She gives her spiral design as one of the lessons, and it is really pretty! So, you can work her design, or, using the principles she gives, you can design your own. And then, one more step above ordinary! I love this section – it’s called “Design Sheets” and it is six pages of individual motifs that can be combined in heaps of ways to create your own crewel designs. I love resource pages like this! 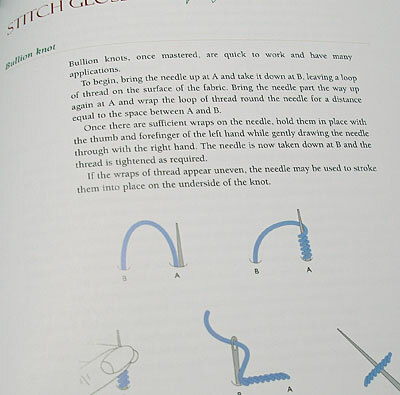 … a stitch glossary with diagrams of all the stitches she discusses in the book. This is a good book, and if you’re interested in designing your own crewel embroidery pieces, this book makes an excellent resource. 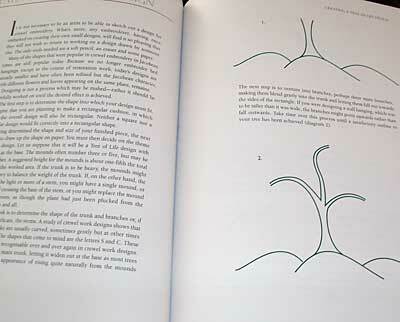 As far as most “how to” needlework books go, it is out of the ordinary, because the author goes beyond simple design copying by teaching basic principles in creating your own designs. It brings to mind the well-known proverb: Give a man a fish, and you feed him for a day…. teach him to fish, and you feed him for a lifetime. While the analogy may limp slightly, I like this approach in a needlework book, don’t you? In the US, you can find Crewel Embroidery: A Practical Guide through Amazon. 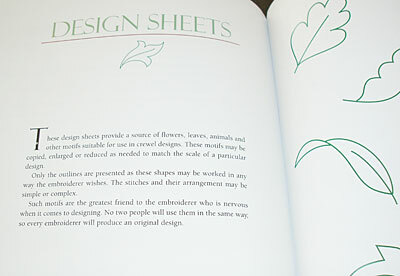 Worldwide, with free shipping, you can find Crewel Embroidery: A Practical Guide through Book Depository. This is my kind of book. One that I could come back to over and over. You can always succesfully come back to a solid foundation. A poor one will let you down every time. Your fishy analogy is good. Teach him how to fish and he can help someone else as well as himself. I like the idea of the design sections. Everything seems to be really well thought out. Including your review. Thanks. Funny thing happened at the library (No, I wasn't playing Cluedo). 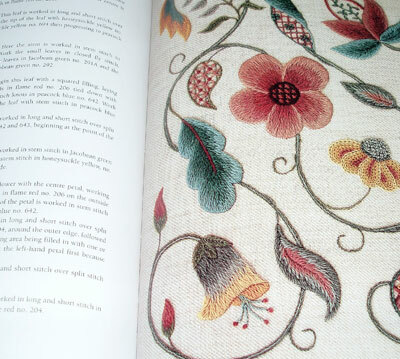 Was browsing some embroidery books and on the cover of one was a very appealing crewel embroidery. Flicking the pages here's this section on crewel and blackwork. Designs etc appealed so borrowed it only to find it was all done with plant seeds!!! Amazing. There was even convincing goldwork! Seeds were painted for that though. This is a nice one. With your help, reading your book reviews I am starting to collect my own library. I also have a question about the book called Church Embroidery and Church Vestments. Are the illustrations black and white? Like in those free PDF files that are available now? And have you seen a book called – High Fashion in the Church: the Place of Church Vestments in the History of Art From the Ninth to the Nineteenth Century? Hi, all – Glad you like the review! Larissa – yes, even the original copy of the book is in black and white. The pictures are very clear, but still black and white. Incidentally, there is an image in the book (the Good Shepherd) that is shown in the process of being embroidered, again, in black and white. Ages ago, a friend sent me an e-mail of the same exact piece, only it was a colored photo. I never found out where she got it. I haven't heard of the book you mention. Have you seen it? Is it good? Is it something I should look for? I was looking up the book on Church Embroidery in the net, hoping to see colored pictures and came across this book – High Fashion in the Church. You can find it on Amazon. And I found a site where you can see some pics of the pages. I don't know how good it is in terms of finding embroidery patterns, but there are some close-ups of vestments. Thought you might be interested. What I like about this book is that the pictures are clear enough you can actually see the stitches. All too often you can see the effect of the stitches but not the stitches themselves. Your book review today is so timely! Am just starting to stitch some crewel designs and as a beginner, i have a lot of questions that I think this book can respond to very ably. Particularly regarding "decisions" that arise when stitching various elements of a design – which to stitch first and why, as an example. Love the idea of the color selection tutorial, too. This is the first time I've seen this addressed in a book on crewel embroidery. As usual a good review, Mary! For long I only buy embroidery books reviwed by you. Thanks for reviewing this book. Your reviews are always very thorough. I really like that you show pictures of the book. Several comments- I love your site. Couldn't believe the questions of the Wed.? post. I tried to enter the wool giveaway but I'm not the brightest penny in the pool when it comes to using the computer. Re. this book review-Whatever anyone can learn about color is always a bonus. Esp. how colors affect one another when placed together on fabric. You cover this very well in your projects. I went back to the old eccleastical posts- your rooster and esp. your pomegranate rank up there with the best of them. It made me realize that a lot can be accomplished in a little time. Those big projects are do-able. Thank you for so much teaching and inspiration. ooo…this sounds great! 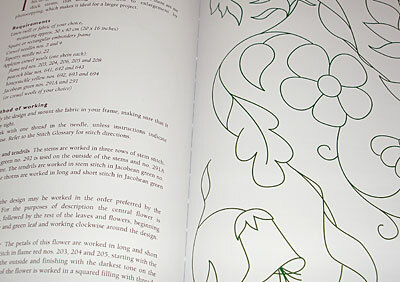 I wanted a book that included designs plus the stitches that went with them, and this is one of those – thankyou. And the fact that is teaches you how to design for yourself is invaluable. Well, your positive review was a relief since, coincidentally, I just ordered the book yesterday sight unseen! Sounds like it was money well-spent. Thank you so much for this! 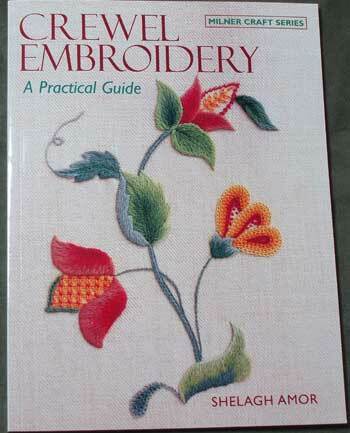 This is the Crewel Embroidery book for me! It is winging itw way towards me from Amazon UK even now. I'm really excited about the design section, as that is the part I struggle with and while I enjoy interpreting other people's designs I really do want to move twoards doing my own. 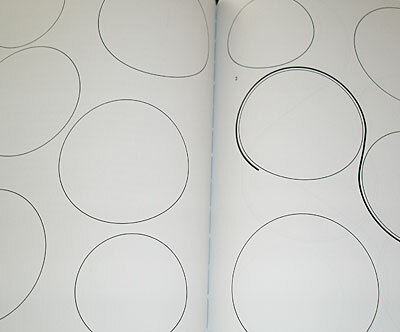 I love the idea of pages of circles to help with spiral designs – I'll be looking out for this! Thanks Mary for this review. Although I have never done crewel work I ordered this book and plan to give it a try. I do many other types of embroidery so can't wait to get my hands on it. Thank you, Mary for the review. This book looks very interesting for the "how to do your own design" and I also like very much the style of the author. I've bought the book. I won't be doing crewel work for … a year or two – but I neeeded it, after your review, because it sounded perfect for my needs. Thankyou for the review. Amazon shipping costs are less than half now to Australia than they were (and presumably to everywhere else as well) – presumably because of Book Depository's free shipping. Yay! Anything that means cheaper books is a great thing! O! I just love this one. I'll have to get it from the library and check it out. Estou fascinada com este livro, pena que eu moro no Brasil, aqui onde moro não tem essa maravilha, gostaria de ganhar um deste até mesmo porque não posso comprar. Eu agradeço antecipadamente vossa compreensão. Previous Previous post: Renaissance Dyeing Crewel Wool Winner! Next Next post: Goldwork Embroidery: Finishing the Fruit!